My mother made this many times for our church youth group, and we have served it several times for events at Adrians. A great make-ahead dessert…very easy and always a hit! Bake cake as directed in a very well greased 9×13 cake pan. Let cool for 10-15 minutes, then remove from pan onto a foil or wax paper lined cookie sheet. Let cool completely. Using a long bread knife, slice cake in half horizontally (actually easier than it sounds). Using two large flat spatulas lift top of cake off to another piece of waxed paper. Leave spatulas under cake. Take ice cream out of the freezer and unwrap completely. Cut ice cream into 8 even slices (about 1/2 -3/4 inch thick). Place ice cream slices onto bottom half of cake. Carefully lift top of cake back onto the ice cream layer. Put another piece of wax paper or saran wrap on top of cake, then wrap completely in foil. Freeze until firm. When ready to serve, cut the cake into serving size pieces. Warm hot fudge sauce according to package directions. 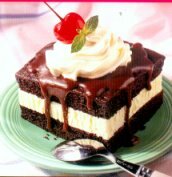 Top frozen cake with a generous amount of hot fudge, then top with whipped cream and a cherry. Serve immediately. Yum! This is the perfect recipe for a crowd! You can make several cakes and just leave them stacked in your freezer. Looks like a very fancy dessert, but very easy to prepare and you can make it way ahead of time. Enjoy!!! PS. We always LOVE to hear from you…would love to share one of your favorite recipes with our clients!